tribe (Tribe leader: Jaesang Lee) completed the Bible Study Course at the Zion Christian Mission Center. Chairman Man Hee Lee preached at the service. Chairman Man Hee Lee is preaching at the service. 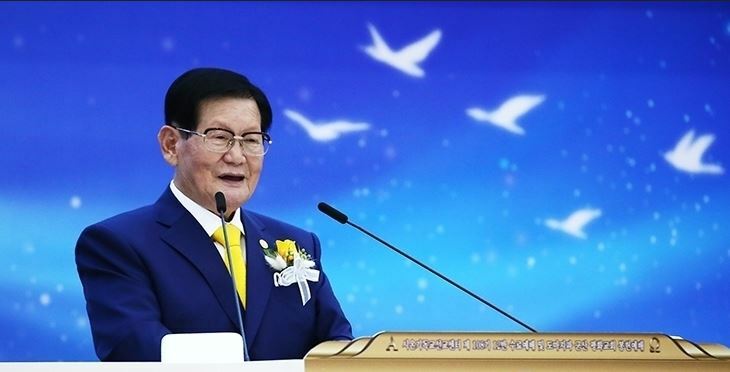 Shincheonji Church of Jesus, The Temple of the Tabernacle of the Testimony (Chairman: Man Hee Lee) continued its growth with a graduation service of more than 900 graduates in Jeonbuk province. 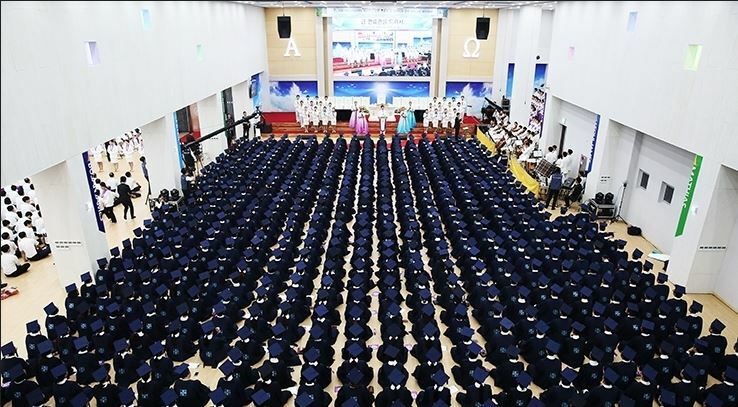 Thomas tribe of Shincheonji church hosted 'Zion Christian Mission Center's 108-12 class graduation ceremony' and 'Dedication Service of Gunsan Peace church' at Gunsan Peace church, Jangmi-dong, in Gunsan city, Jeonbuk province, at the 9th of this month. 918 graduates, who were the stars of the day, were people from Jeonju, Iksan, Gunsan, Jeongeub etc. who have entered Shincheonji church after having completed the Bible study course taught at Zion Christian Mission Center. Some attention was drawn to overseas graduates from the U.S.A. and other countries who participated in the ceremony. Shincheonji Church of Jesus, which grows steadily every year, has accepted more than 50,000 people from Korea and all over the world for its Bible study course. Around 4300 people from Germany, Gwangju of Korea and Republic of South Africa etc. graduated from the course in the first half of the year. Thomas tribe has shown dramatic growth with 5000 graduates over the last 5 years. Many believers - not only in Korea, but also in San Francisco, Uganda, Kenya, Indonesia and Cambodia - have been knocking on the door of Shincheonji church, drawing attention from the outside world. and Dedication Service in Gunsan Peace church Thomas tribe'. Zion Christian Mission Center, which is the affiliated educational department of Shincheonji Church of Jesus, teaches the whole Bible from Genesis to Revelation according to the 5Ws and 1H. After completing a 6-month Bible study course (Elementary·Middle·High) and graduation examination, students can officially enter Shincheonji church. 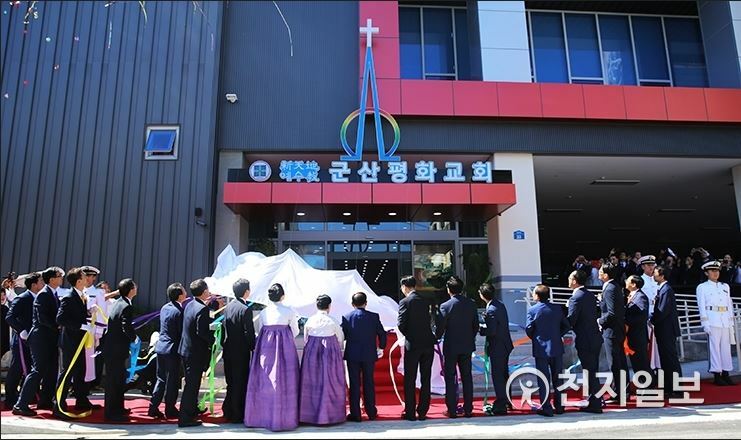 Gunsan Peace church’s signboard hanging ceremony was held. Thomas tribe’s Gunsan Peace church of Shincheonji Church of Jesus first dedicated its building at Soosongdong in 1996. It then moved to a new building in Jochondong in August of 2001. Gunsan Peace church, which was asked to relocate to a larger church space, had selected the site of its current location as the new church. After two years of construction, the church finally held its dedication service.